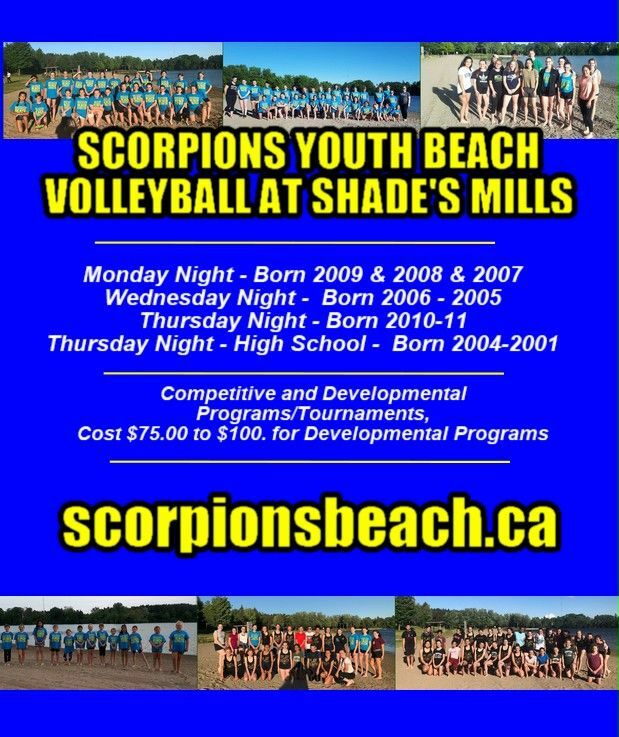 SCORPIONS YOUTH BEACH VOLLEYBALL Program has girls and boys from Cambridge, Kitchener, Waterloo, Guelph, Woodstock, Brantford and ​surrounding areas. 400 youth play Scorpions Beach Volleyball. Learn to Play, Summer Leagues, Competitive Beach Duos, Tournament, , Boys Summer Programs and ​ FREE adult beach volleyball for parents with children registered in our beach programs. NEW - SCORPIONS ANNOUNCE 2019 OPEN YOUTH BEACH VOLLEYBALL TOURNAMENTS COMPETITIVE AND RECREATIONAL DIVISIONS, Cash Prizes!... NEW ADULT BEACH VOLLEYBALL....NEW BOYS SUMMER PROGRAM,,, BEACH DEVELOPMENTAL PROGRAM AT SHADES MILLS REGISTRATION HAS STARTED...COMPETITIVE BEACH DUOS PROGRAM ANNOUNCED...Summer Camps have been Announced. Click on poster for all the info on our programs at Shade's Mills.